The amount of people doing their 9 to 5 in Starbucks surely indicates that freelancers need more desks. From the pricey lattes to dodgy wifi, coffee chains aren’t known for their productivity. That’s where places like Coworkshop swoop in to save busy but desk-less workers. 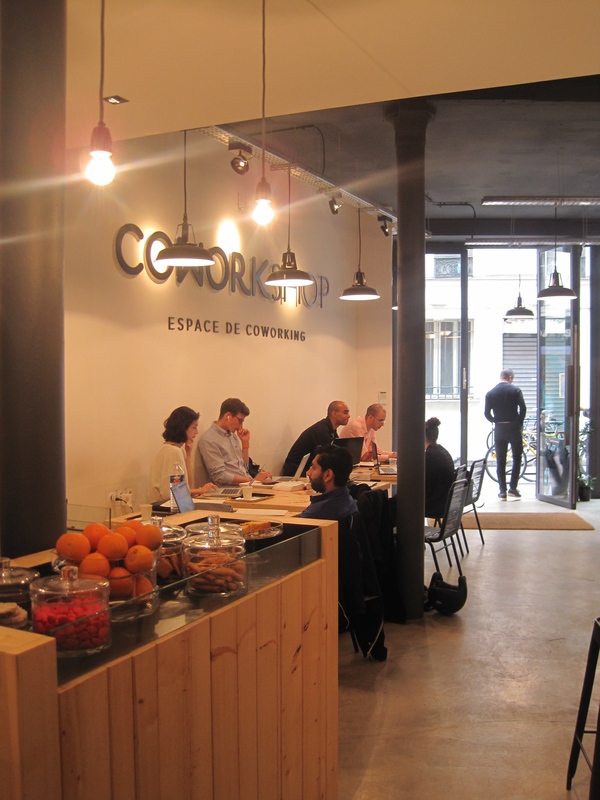 Based on 29 rue des Vinaigriers, a trot from Canal St. Martin, Coworkshop is a large coworking space for freelancers and small business. Imagine a converted warehouse loft — exposed brick, wooden tables and a Brooklyn style coffee bar — with all the necessities of a modern office; meeting rooms, a telephone booth and private spaces. Coworkshop’s tarif is divided into Nomads and Resident Members. ‘Nomads’ work on a pay-as-you-go basis. Paying 4€ per hour (plus 3€ for each subsequent hour) gets you wifi access, unlimited tea and coffee, as well as complimentary snacks. I spy apples, peaches, Haribo and lemon drizzle cake amongst the offerings. Resident Members are usually small companies who’ve set up shop here, and can enjoy the benefits of an office environment like printing, locker rooms, use of the meeting rooms etc. Coworkshop’s co-founder, Maxime, was inspired to open the space during his own freelance career. After learning of the coworking concept, he scoured Paris for examples but found they were very “tech-focused” and often alienating. 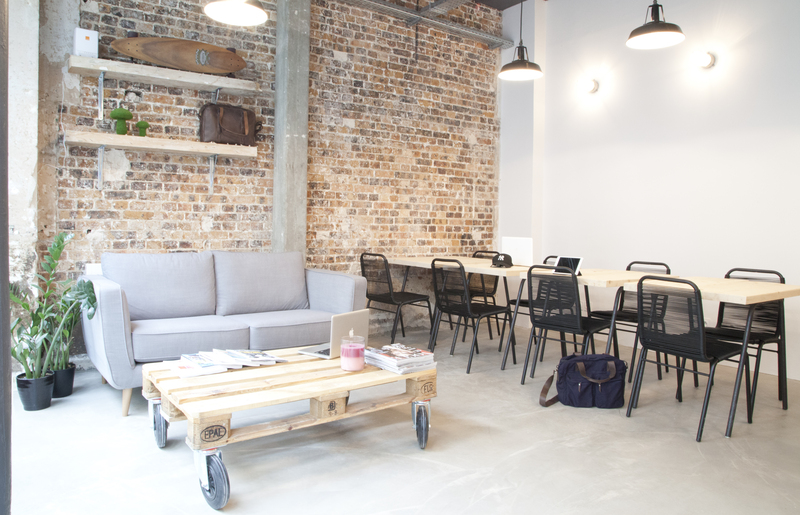 He wanted to make coworking open to all creatives, starting with a design-led space and relaxed atmosphere. 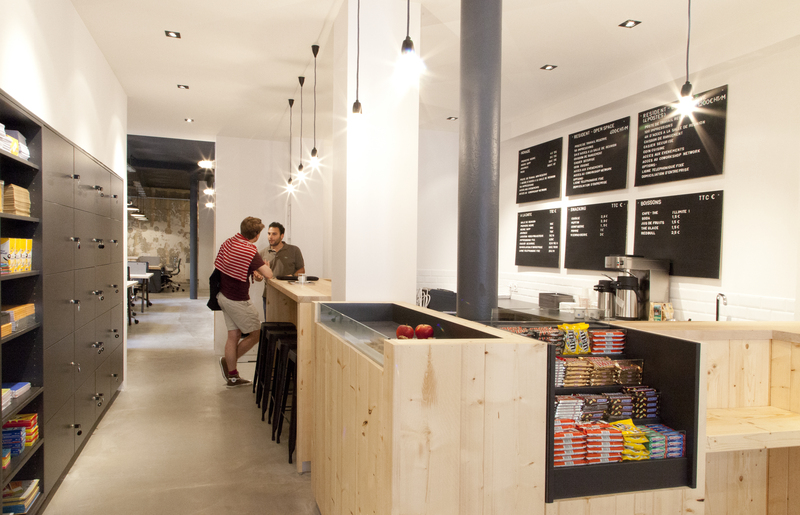 Looking around, it’s clear Maxime’s fulfilled his goal: the ambiance is laid-back and welcoming. And while the space is quiet, there’s light chatter from the meeting of minds. Maxime went on to divulge that amongst Nomads, around 70% are regulars, and Private Office spaces are fully booked on a longterm basis. The classroom-style Polaroids show there are several Coworkshop fans. Location was chosen wisely. Down the road from mainline and international train stations (Gare de L’Est / Gare du Nord) and République metro, makes it ideal for any London to Paris commuters. A library / café environment where you can work productively, without the eternal fear of asking a stranger to ‘watch your computer’. Coworkshop has got the freelance formula just right.